Getting acclimated to any new city is not always easy. Moving to Raleigh in August of 2016 was certainly an adventure. But while we miss our friends and family in Buffalo, NY, we have family and new friends here in Raleigh and Cary. People here are generally very nice. And while my voiceover business has continued to expand, I haven’t had all that much voiceover business in the Raleigh Durham area since moving here. I think that is to be expected as local producers and recording studios aren’t nearly as excited that a new voice talent has moved into the area as the voice talent is to now be the new kid on the block. But remember how I said people here are generally very nice? Well I have found that to be exceptionally true in the voiceover community. When I floated the idea of a new RDU voiceover meet-up group, I wasn’t sure how that would go over. But local folks I’ve known for years like Rowell Gormon, Debbie Stamp and Wendy Zier introduced me to other Raleigh voice talents like Mike Urben, Bill Jordan, and Kevin Silva among many others. The meet-up has gone well (but I have to schedule the next one, thanks for the reminder). 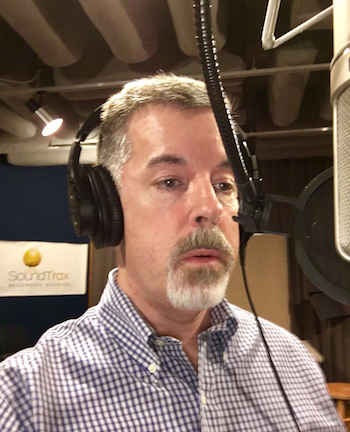 These fellow voiceover talents also introduced me to some great recording studio producers including Tom Guild and Becket McGough (who are also great voice talents) over at Soundtrax Recording Studios in Raleigh. The studio is generous enough to play host to our voiceover meet-ups. Becket especially has been working to get me into record. This week I was hired for my first major local project. At Soundtrax! The work, while terrific, isn’t nearly as impressive to me as the kindness Tom and Becket have offered this “new” voiceover kid.